Ginza Miyako is on the first floor of the Stamford Plaza Hotel and fronts onto North Terrace. It’s part of Taste of the Orient Group that’s also responsible for Ginza Japanese restaurant, Burger Foundry, Golden Dragon Palace Seafood Restaurant (Yum! ), Indochina and establishments overseas. The food you’ll get at Ginza Miyako is different to any other Japanese food in Adelaide. Sister restaurant Ginza on Unley Road and other Japanese restaurants present a more traditional menu, Kenji offers his own take on modern Japanese food, but at Ginza Miyako, chef Kazuki Ushiro San, having worked in restaurants in both Tokyo and Paris, serves up a beautiful union of French and Japanese cuisines. Even one of my friends who has always been extremely anti-fusion food, is impressed with Kazuki’s food, which is based around the freshest of Australian produce. My dining partner for this particular evening is a sashimi lover, and so am I, so we started off with the Chef’s Selection of Seasonal Sashimi, a super-fresh textural delight. I could seriously eat a bucket of sashimi every day. Then onto the King Crab Chawanmushi, an egg custard with king crab, water chestnuts, okra and shitake mushrooms. Deliciously light and silky. Then onto mains. For this, Kazuki, the man himself appeared and talked us through a few dishes. He explained he was launching his new menu in only a couple of days so we could try dishes from either. We chose the duck dish from the current menu and the lamb from the new menu. 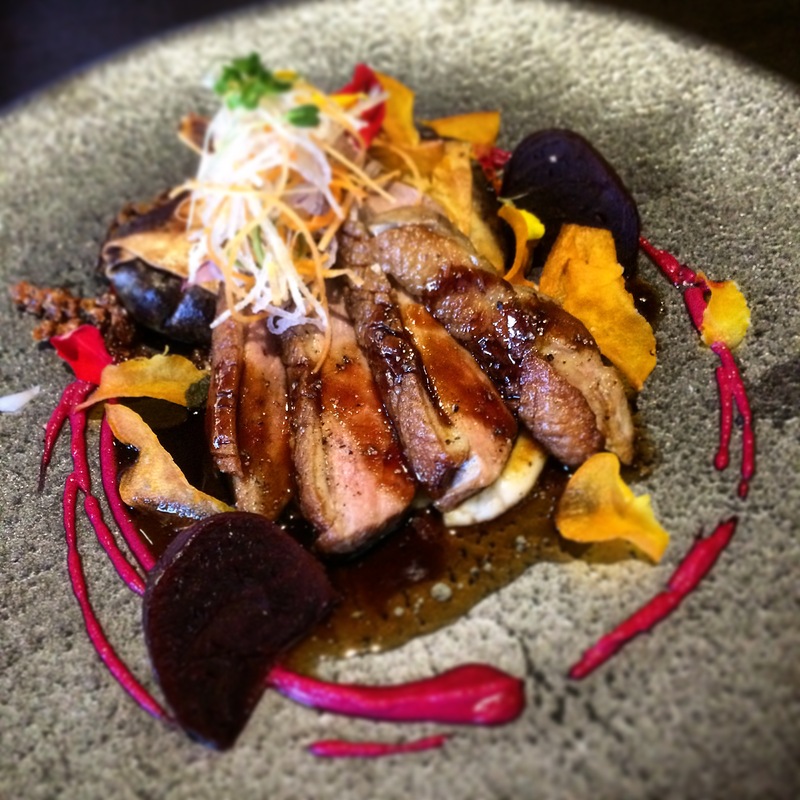 The Roasted Duck Breast and Leg Spring Roll with Beetroot was simply stunning – both in appearance and in taste. The Lamb Cutlets with striped eggplant, lamb mince, couscous, black miso and mango chutney was not at all disappointing either. I’m not usually a fan of couscous but there was so much flavour worked into it, it was delicious. And then… the piece de resistance… the dessert. What’s that, I hear you say? Jacqui doesn’t even like dessert!! Well, Jacqui not only likes, but LOVES this one! It’s Kazuki’s signature dessert – the Macha (green tea) Tiramisu Served with black sesame ice cream, macha nuts and cocoa crumble – and thankfully, it will still feature on the new menu. Why did I love this dessert so much? Well, firstly, it wasn’t overly sweet – in fact it was a blend of a slight bitterness and sweetness. Secondly, it was so beautifully creamy (anything made with mascarpone has to be good, right?!). Thirdly, you can’t beat that black sesame icecream!! I seriously cannot get this dessert out of my head!! Me…want…again!! With mains priced between $32 – $49, Ginza Miyako isn’t your cheap ‘n cheery Asian night out, but it’s an experience you get here – attentive service plus great food. Oh, and it’s on the Entertainment Card too. We were in raptures. I think Kazuki’s food is currently the best it’s been. P.S. Also worth booking in for is the High Tea here – usually every third Sunday of the month. I’m not generally a fan of high teas, but I highly recommend this one! I was pleasantly surprised – great variety and a good combo of sweet and savoury. The Tiramisu with black sesame ice cream sounds awesome!